In an interview with the NY Times, Mindy Kaling was asked what her ideal book club would be like. She said "My book club would be held on Sunday afternoons. Dress code: warm-weather black tie. Cocktails from 3 to 3:30. Chitchat from 3:30 to 4. Personal drama from 4 to 5. Book discussion from 5 to 5:30. Early dinner from 5:30 to 7. Then everyone goes home." Oh how I wish I could be in Mindy Kaling's book club! But this is the next best thing. What did you think of her book? Why Not Me? made me love Mindy Kaling even more than I already did, which is probably too much for someone I don't actually know in real life. Maybe it's because we recently got rid of pennies in Canada, but that part made me laugh so hard. I loved that she showed us basically a photo essay of her typical day. I found it to be so interesting and appreciate more what goes into a half-hour show each week. Plus, nowhere in her typical day did she include time to write her own book. Twice. I loved that while much of the book was very funny, there were some valuable discussion about just plainly living a good life, being a good person, and finding happiness in your own way. I tip great, I try not to swear too much, and I remember to thank people and be grateful. And all that stuff I do to "appear" better has actually made me a better person. I wish I had always acted like I was a little bit famous. I loved what she wrote about ending friendships and found it interested how she left her sorority. I texted one of my friends immediately when I got to this chapter because I had basically blogged about the exact same thing the day before I started reading this book. I loved how she described her relationship/friendship with B.J. Novak. They're one Hollywood couple I've always been a bit interested in. Are they together? Are they not? It's really none of my business, but I enjoyed reading about them and their "soup snakes." The one thing I didn't love was the same thing I didn't love about the first book. She talks about being a size 10 and how she feels this is "chubby." I really don't think a size 10 is chubby. I'm a size 10. I think that's a great, healthy size. While I totally understand that in Hollywood, thin is means really thin, I just wouldn't want someone else to read her book and think, "Wait a minute. I'm a size 10. Am I supposed to be a smaller size? I had no idea." Because, that's what I was thinking. 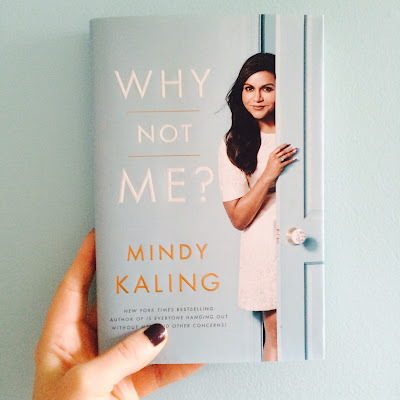 What did you enjoy about Why Not Me? Was there anything you wished she talked about more? Less? What was your favourite quote from the book? Let's get a discussion going in the comments. I'm going to join in as well! PS - Just a few more days to enter my blog birthday giveaway here!